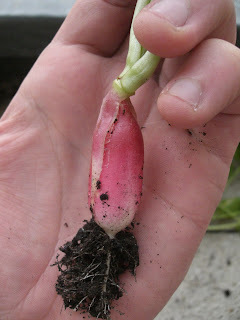 The London Vegetable Garden: My First Crops From Pots! Very nice! Have you tried carrots or onions yet? Maybe even beets or garlic? The possibilities are endless. We have our own garden but it's much bigger. We have blueberries, raspberries, garlic, jerusalem artichokes, potatoes, tomatoes, peppers, grapes, cherries, sunflowers, peas and beans and I have a herb garden as well. We keep adding to it every year. Eventually we won't have a backyard just yummy stuff to eat. All of this on a 1/2 acre lot. Good luck with all your plants this year! great work! loving the seed packet/show photo!! 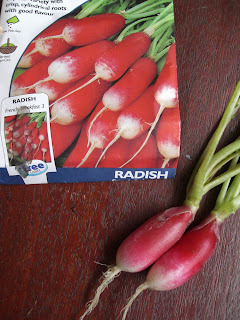 very photogenic radishes indeed :) do they taste as good as they look? What inspiration! I'm hoping I'll get to my harvest before the squirrels do. :-) I've just started organic veggie gardening in Washington, D.C. and have been fortunate enough to be able to blog the whole way along. Keep up the interesting posts and congrats! Congratulations on your first 'Crops from Pots'! Isn't it a terrific feeling, growing your own food? So now we know how good they look, let us know how good they taste! Far superior to anything you'll buy in the supermarket, for sure. Awesome dude - how did the taste? Thanks to everyone for the kind comments. 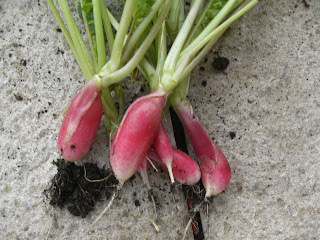 It really was a great moment to pull radishes up from the soil, wash them and then eat them as part of a salad - the difference in taste was simply unquestionable! I hope the tomatoes do the same!